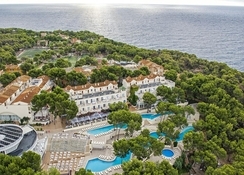 Iberostar Club Cala Barca is a wonderful kid-friendly hotel in Majorca situated near the quaint fishing village of Porto Petro. The seafront hotel is an absolute delight for your little ones. 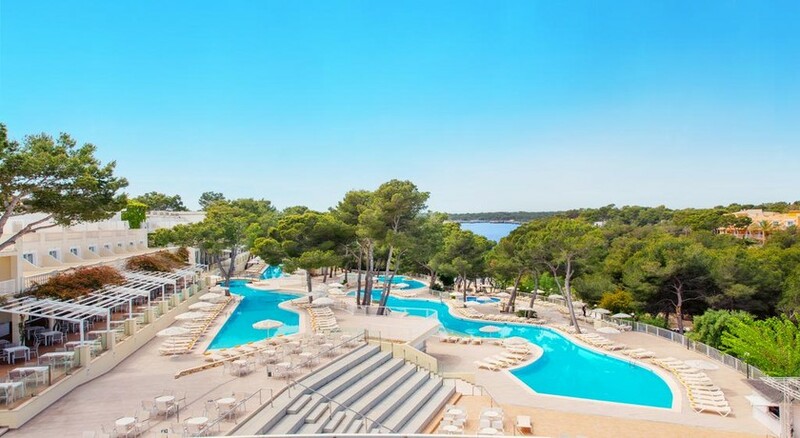 With as many as four children’s pools, clubs for their entertainment and dozens of workshops and programmes, this hotel is the perfect choice if you are looking to spend some quality time with your family this summer. While your children are busy making friends and enjoying pool time, you can take time out to check the nearby village and the rustic beauty of its surroundings, or if you’re looking for a relaxing day, take a dip in one of 8 swimming pools. The on-site wellness centre offers rejuvenating spa sessions and massages, while sports activities such as tennis or football and water sports like snorkelling or paddle boarding keep the active souls engaged. This 4-star hotel comes with 695 rooms, which are divided into 12 different types. The rooms are spacious and come with a host of world-class amenities. Further, the hotel offers a range of international cuisines at its buffet restaurant, bars and beach club. The hotel is located in Porto Petro, a quiet fishing village in the municipal district of Santanyi. The nearest airport is Son Sant Joan International Airport and the nearest big city is the capital city of Palma. Both are about 50 km from the hotel. The two nearest beaches are S’ Amarador and Cala Mondrago. The hotel is close to the Mondragó Natural Park. It is only 7 km from Cala d’Or. There’s a total of 695 rooms divided into 12 categories suitable for different types of families. The all-white rooms are spacious and have a modern feel to them. They come in the following broad categories: Double Rooms, Superior Double Rooms, Family Rooms, Interconnected Family Rooms, Side Sea View Room; Priority Location Family Rooms, Junior Suites and Suites. The rooms have access to free Wi-Fi facilities, en-suite bathrooms, safes, mini bar, microwave, flat-screen TVs and king- and queen-sized Balinese beds. The largest suites are 54 square metres in area and have stunning views of the swimming pool. When it comes to gastronomy, you’ll be spoilt for choices. Leave the tough task of choosing a restaurant on the hotel itself, which offers all-inclusive and unlimited packages. In such packages, guests can get complimentary breakfast, lunch and dinner along with a choice of premium drinks. The hotel has a total of five restaurants, four bars and a beach club, where guests can enjoy a wide range of cuisines. Further, the cooks of the hotel organize live cooking sessions for the entertainment of the guests. 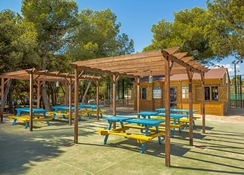 The dining venues on site include Baleares restaurant (international cuisine), Capricho pizza restaurant (Italian and Mexican food), Mediterranean restaurant (traditional Majorcan dishes) and a food truck selling snacks and finger food. 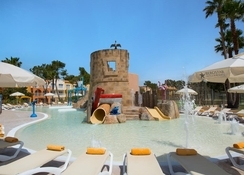 It is not without reason that Iberostar Club Cala Barca is especially popular with kids. The hotel goes out of its way to make your kids feel special. 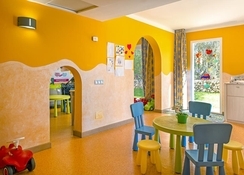 The Miniclub of the hotel organizes art workshops, water games, handicraft classes for children. There are 4 pools for children and 5 for adults. Adults can pamper themselves at the hotel’s spa, work out at the fitness centre or sunbathe in the solarium. Guests can explore various sporting activities at the hotel, such as tennis, paddle tennis, football, table tennis, Pilates, aerobics, Zumba and archery. The shallow waters of Mallorca are excellent for scuba diving, while the mountainous terrain makes for a great day of hiking. The Mondragó Natural Park located close to the hotel makes a great option for excursion with kids. Every night, the hotel puts up a fabulous show featuring cabaret dance, live music and magic.